Structure Ten starts to emerge from its winter slumber. 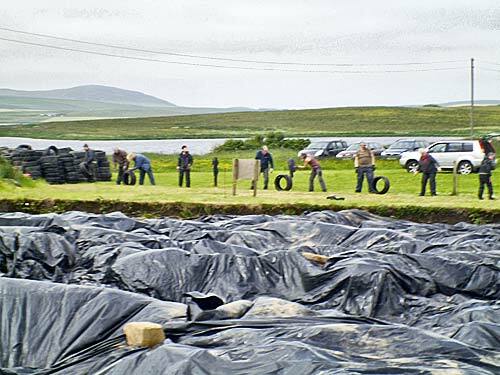 The tyres, black plastic and sandbags, which have protected 5,000 years of precious archaeology over the winter, are slowly being removed and the Ness of Brodgar 2015 season is now fully under way. Oh, and the sun is shining! Regular readers, in recent years, may have noticed that we tend to major on the weather — for obvious reasons. 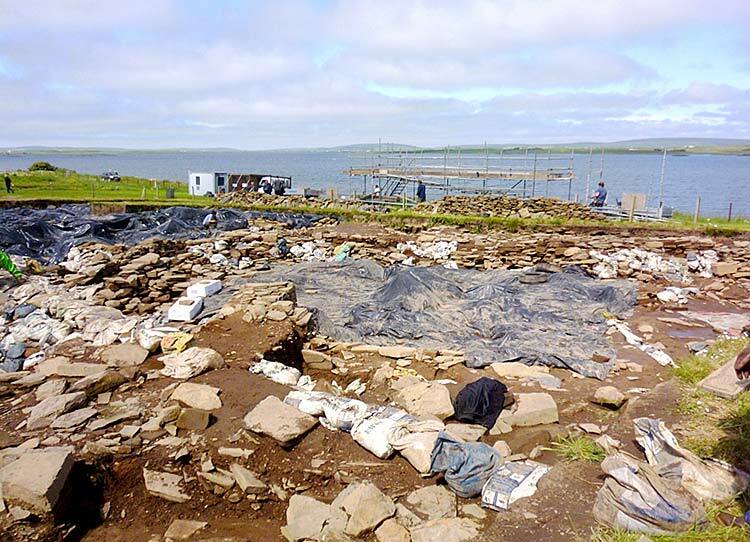 The Ness of Brodgar site is not the most sheltered of places and we would have thought that Neolithic planners would have had more consideration for their descendants, especially those with trowels. But actually, they did. As we keep saying to visitors, the Ness and all that it implies, is in the best possible place — squarely at the heart of Neolithic Orkney and probably at the centre of the thoughts of Neolithic peoples over a much wider area. Anyway, there will be no more whining about the weather. At least, not until tomorrow (it’s a very poor forecast!). Bailing out the water from Structure Twelve, after an incredibly wet winter, spring and early summer. The vanguard of our team — only 45 this week — have done magnificent work on the site today. Make no mistake, removing tyres and sandbags is hard, dirty work, made worse by the fact that sheep have been all over the field in the winter and that more than a few rats have nestled, comfortably, in the tyres over the same period, this being a thoroughly rural area. All protective measures possible have been taken and we were so pleased to be joined in this onerous task by several holidaymakers, who volunteered, and worked long and hard, to help the diggers. Elsewhere, the scaffolding platform is coming on nicely and should be approaching completion by tomorrow, ready for the arrival of more tourists and the start of our regular tours on Wednesday. 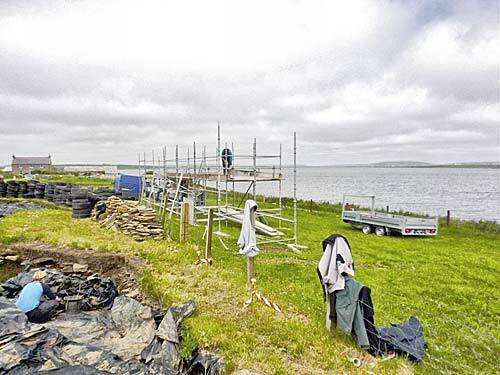 The scaffolding viewing platform nears completion, thanks to Orkney Scaffolding. Through the piles of tyres and whirling plastic, the familiar sight of excavation director Nick — complete with favourite hat — could be seen staring pensively at the emerging structures. As ever, the way the excavation proceeds this year will be just the same as preceding years. In other words, everything can, and probably will, change at a moment’s notice. His initial plans for the 2015 season are to reveal more of the occupation floors within the structures and to undertake stringent sampling of these floors to discover how the various structures were used — and how those uses may have changed over time. This will also allow use comparisons between the different structures, and all the information gathered will then be merged with new radiocarbon dates, which are coming in now through the site’s participation in the major European Neolithic dating programme called The Times of Their Lives. There are also plans to expand Trench T — the large trench on the far side of the site, where the remains of what may be an aurochs (a primitive and very large form of cattle) were found at the end of the 2014 season. The last of the tyres are stacked, ready for next year. 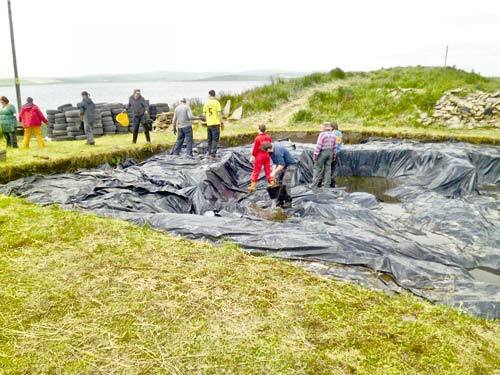 The bottom of the trench nearest the Stenness Loch will also be enlarged to clarify what is happening there. Last season, the stump of a standing stone was found in that section of the trench. Was it just a single stone or are there more, perhaps even forming an avenue? Time and more digging will tell. We hope that you enjoy our daily diary but your enjoyment will be enhanced hugely if you have a copy of the new site guidebook by your side. With its help, you will be able to trace every move which takes place over the next eight weeks and will be able to pinpoint exciting finds and developments accurately. This applies particularly if you are outside Orkney and unable to visit us. All proceeds go to excavation funds and the book, financed by the American Friends of the Ness of Brodgar, is available widely and on the internet at http://www.nessofbrodgar.co.uk/shop/4589691909.